"In the midst of our incredibly busy lives, we wanted an intimate, personal wedding," reveals Emily. With only 28 guests, including the bride and groom, Emily and Patrick's wedding was just that: a small and lovely family celebration. The couple were wed at the Cleveland Botanical Gardens on September 18th, 2016. Emily and Patrick had visited the gardens together on previous trips to Cleveland (Patrick's hometown) and had admired the verdant grounds and talented staff. What's more, the Gardens are home to six interactive, locally-designed treehouses, making it the perfect venue for the treehouse-loving couple. Pete also harbored a personal connection to the venue; he had the honor of keynoting the opening ceremony of the Gardens' treehouses in 2014. At that event, Pete snapped a selfie under the same exact oak tree that Emily and Patrick unknowingly selected as the backdrop to their ceremony. Clearly, Pete's selfies act as portends of good things to come. Emily and Patrick's use of colorful and seasonal flowers, cheery textiles, and lush greens artfully captured the essence of both sumptuous summer and festive fall. Emily loved how Patrick's deep blue suit complimented his eyes, and both were keen to incorporate shades of orange (their favorite color) into their outfits. The couple held their wedding at brunch, sipping mimosas and Bloody Marys over a meal catered by Bon Appétit. For dessert, guests savored sweet berry tarts and other small treats in lieu of the conventional cake. After brunch, Emily and Patrick made the spontaneous decision to take their party to the Indians' baseball game. Emily tossed her bouquet in the stands, and the whole party gathered for a photo with the team's mascot. The game was a perfectly playful ending to Emily and Patrick's wedding. Read on for more wedding photos (by Lauren Gabrielle), details, and a Q&A with Emily! Without knowing that Pete had visited this oak tree before, Emily and Patrick selected it as the backdrop to their ceremony. Pete snapped a selfie with this same oak over two years ago! Emily and Patrick planted a redwood tree during their ceremony to symbolize the beginnings of a deep-rooted and lasting marriage. The sapling came from "Trees of Mystery," a place they found on their first road trip together up the California coast. Emily selected seasonal flowers like dahlias in bright, bold colors reminiscent of summer bouquets. The Cleveland Botanical Gardens is home to six stunning, locally-designed treehouses, making it the perfect venue for Emily and Patrick. 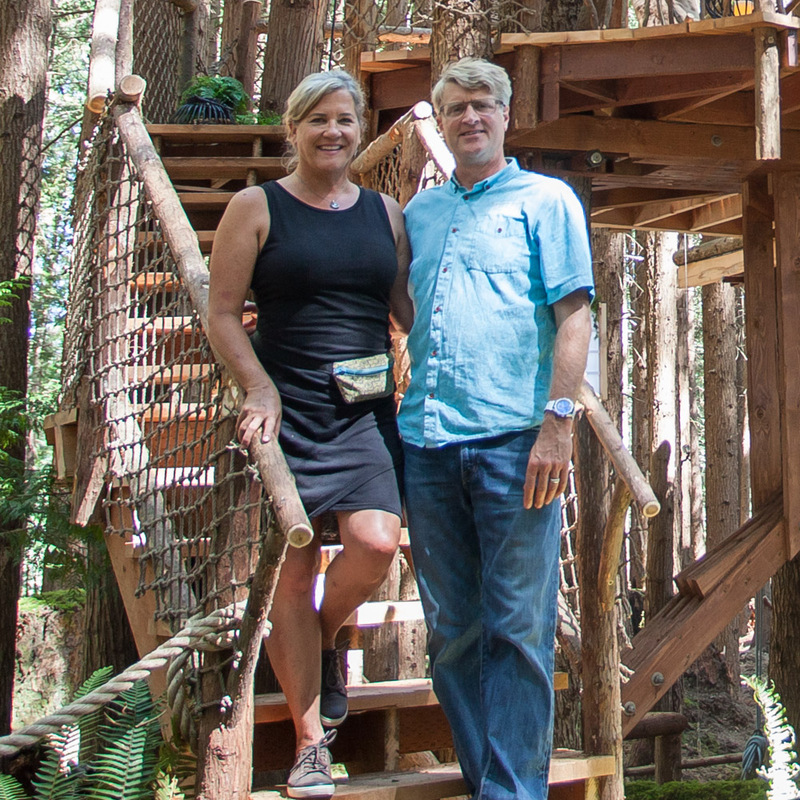 The couple met working at Nelson Treehouse and Supply, and love living the treehouse life. Pete joined Emily in the treehouse for this magical father-daughter photo. Emily and Patrick kept their wedding ceremony an intimate family event, but plan to host a larger party next summer to celebrate with extended family, friends, and lots of live music. Hand-calligraphed names on fabric leaves topped clementines for cheery place cards. The couple brought a touch of Seattle to their table with GlassBaby votives. Guests kept the votives as favors. Bon Appétit made these delicate desserts. Emily with her mother, Judy. The Nelson family grew a little larger that day. Left to right: Henry, Judy, Patrick, Emily, Pete, and Charlie. Only a couple weeks before the wedding, Pete and Judy celebrated their 30th anniversary! After brunch, Emily and Patrick spontaneously decided to take their party to the Indians' game! Emily even tossed her bouquet to ladies in the stands. The Nelson family remained avid Indians' fans after the wedding, cheering for the team throughout the World Series. Though the Indians lost in game seven, they won in the Nelsons' hearts. Even Bun became a fan! The wedding party with the Indians' mascot. After their wedding, Emily and Patrick spent several weeks honeymooning in Croatia, Bosnia-Herzegovina, Slovenia, Vienna, and Prague. From everyone at the Nelson Treehouse family, we wish Emily and Patrick a lifetime of happiness, love, and trees!